That’s right, according to the US Census Bureau those with bachelors degrees earn $1,000,000 more in their lifetimes than those with just a high school diploma. That breaks down to those with bachelors degrees earning a median of $19,550 more annually than those with just high school diplomas. Even with rising tuition costs, college is still a fantastic investment, so long as you manage the risk. That’s where American college students are running into trouble. College dropout rates are soaring, and students are taking an average of six years to complete a four-year degree, if they complete the degree at all. Financial pressures, health issues, crises, and family responsibilities force students out of college, sometimes indefinitely. Without having earned the degree, they still have to pay back their loans without the added income they were banking on. If you are in this position, you don’t have to keep paying back student loans without a degree. You may not even have to go back to school to finish your degree. 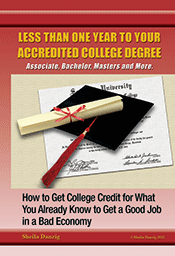 If you’ve already completed college credits, this can count towards your completed degree. If you have years of work experience in which you learned skills and knowledge on the job, this can count towards your completed degree. There are test you can also take that are recognized as college credits completed. If you have completed education or training outside of a college setting, that can count towards your completed degree. Find out what you can do to finish your degree today. Visit TheCareerPeople.com for a free consultation.